The series 'An Odyssey' consists of 20 woodcuts and title page. An edition of 10 was printed by Jenny Pollack in 1989 and hand-coloured by the artist. The gallery has an artist's proof set before hand-colouring. 'The Odyssey' recounts the experiences of the artist's parents, Guiseppe (1909-86) and Teresa Zofrea née Garigliono (1905-75). Guiseppe migrated to Australia without his family in 1949, and was not to see them until they joined him in Sydney in 1956. 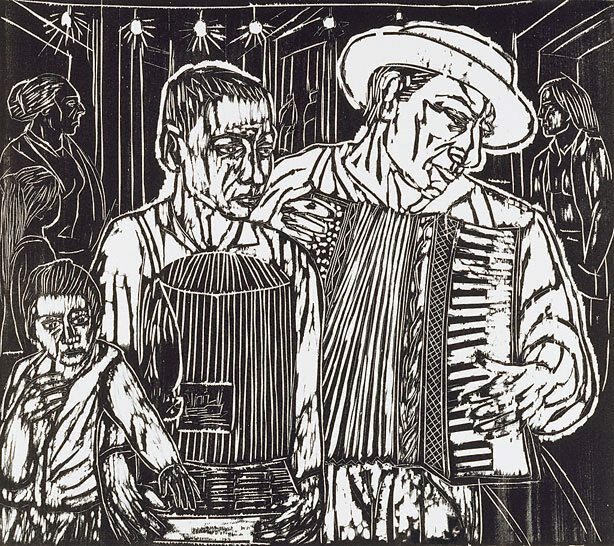 'Life in Borgia - the fortune teller' is based on the artist's memories of carnival time in his home town. Signed l.r., pencil "ZOFREA". Not dated. Glenis Israel, Artwise: visual art 7-10 , 'Chapter 2: Humanity', pg. 69-100, Milton, 2013, 71 (illus. ).